Hey all! Wonder what I’ve been up to lately (perhaps the lack of posts)? Well I’ve been traveling back and forth on my days off to Sturgis, Michigan, home of Hitter’s Edge Baseball Academy. My friend Kevin instructs at the facility and is co-owner with Mike. 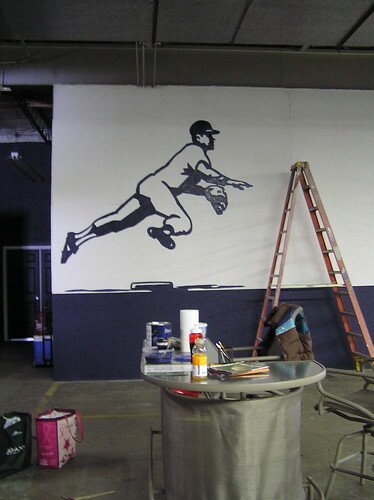 They hired me to do a one-of-a-kind mural to really make their facility stand out. Of course, I was happy to take on the task! Their team colors are navy blue and white, which also happen to be the main colors inside the facility as well. The wall itself is pretty big, about 15ft tall. I took a photo of the wall and went home and made a digital mock-up of the art I would do. 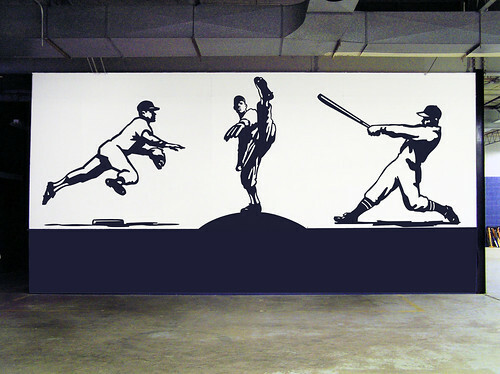 I really wanted to emphasize motion with the art because baseball is such an exciting sport both for the players and to watch. It was a lot of work prepping the wall, putting on a coat of white paint (with a HUGE paint roller), and drawing on the players in sections while on a ladder. This past Thursday, I finally got the first coat of blue on the baseman- because we had record cold temperature this week, the paint was not drying as fast as I would have liked, so I didn’t get to finish him. Hopefully next week I will get it done! I just had to create an account just to leave you a message. (I came across your blog when I was blog-hopping.) Anyhoo- great job on the mural! I actually live in Sturgis & it was kind of a surprise to see my little town’s name on here. I’m unsure exactly where the Hitter’s Edge Baseball Acadamy is, but I’ll have to find out just to drive by and see this in person.